Aplimentec Director, Justiano de Jesus and staffs were welcome Susannah Cullen (Suzie) from Engineering without Border (EWB) Australia to Aplimentec’s office, 24 August 2012, in Liquica district. Suzie will work with Aplimentec for one year period specially in WASH program. Suzie was arrived in Dili since 31 July 2012 and went to Tetun class in DIT for 2 weeks. Suzie present is a part of Aplimentec partnership support from EWB. Suzie will be running her roles to support Aplimentec in developing institutional capacity building and supporting empower the staff on WASH program. Suzie as well will support the engineering team in project management and human resources development inside Aplimentec Foundation. 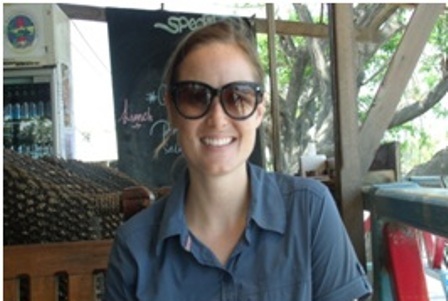 “We would like to thanks to EWB, especially Mr. Kristian and his team which enable Suzie’s presence in Timor Leste. Suzie is not only important for Aplimentec but also for institutional development in overall. We are small institution, but we have vision and dream for a better future, particularly for the community we serve. To get there, we need support and effort from various elements. Suzie is part of that”, said Justiano. “We expect that Suzie will run her roles to strongest this institution. I do believe, Aplimentec will cooperate with Suzie and both side can learn and share more. I know Suzie can do more to support small institution like us”, added Justiano.